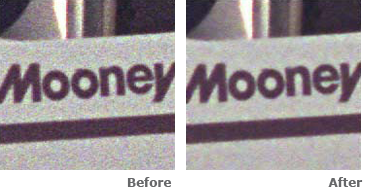 The reduction of grain and noise can be controlled in a "before and after preview" with respect to the final image. This substantially reduces artifacts from noise or film grain. Grain is becoming visible at higher resolutions with high speed film in the scanning process. The SilverFast GANE filter allows you to influence the strength of this function in three easy steps. In addition you can use a slider for fine-tuning. Noise elimination will be more relevant for older scanners and digital cameras.